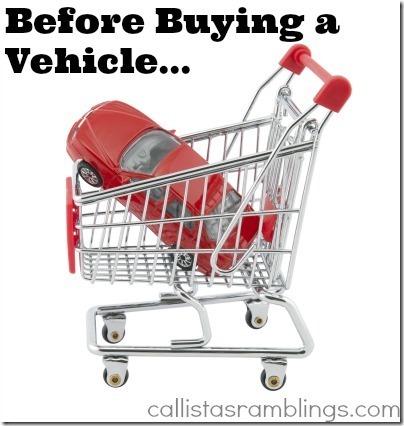 No matter what type of car you are planning to buy, when buying a vehicle there are some things you will need to consider first. You will need to decide what type of car you want. I don’t only mean make and model but also new or used. If you are going to buy a used car, are you planning to go to a used car lot or check local ads? Sometimes a car dealer suggests trading in your current vehicle in exchange for a discount on the vehicle you are going to purchase. This may not always be the best choice as you might be able to get more for the vehicle if you sell it to someone else, but then you have to do the work of selling it. Decide which makes more sense to you. This ties into the first one. Depending on your intended use for the vehicle, you might want to pick a certain one. Is it for driving to work? Is it in the city or a long commute every day? Will you go on frequent trips? Do you need room for children? Do you need lots of storage for outdoor equipment such as camping gear? Will you be off-roading at all? These are all things to consider. If you are bad at navigating or are planning to travel a lot, you might want a GPS. If you go camping a lot, you will want adequate storage. If you have 3 or more young children or might in the near future, you will want one with enough room for all the car seats. How are you planning to pay for the car? Do you have a budget? Even if you don’t live on a strict budget, you should know going in, how much you would be willing to spend on a vehicle. Remember that you don’t always have to pay the price listed on the sticker. Try to negotiate a lower price if you can. Choosing an insurance company is not an easy task. Don’t just go with the first one you hear about but do your research first. The cost of car insurance has to do with the type of vehicle you have as well as the type of driver you are and what company you go with. Make sure you read the fine print with whatever company you end up going with BEFORE you sign anything. What Did I Miss? What Do You/Would You Consider Before Purchasing a Vehicle? Disclosure: This post brought to you by La Capitale.